I worked here in the late '80's it was ICL Bracknell-BRA01, this is the main machine hall at ICL's show site. I spent many hours in this hall in Bracknell, love every minute of it. I was actually there in the hall working while they filmed. Had to duck down out of sight every time they called action. Missed a few and so I am in some out takes somewhere :-) Fascinating weekend. Loved my years working in that computer hall. 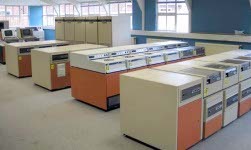 I used to work at BRA01 as a computer operator (started as a tape librarian) then moved onto the Laser printer operator & finally as a fully fledged operator. I am in that picture bottom left in the dar suit. I worked on an ICL 2900 for Southern Water Authority in Brighton back in 1981? 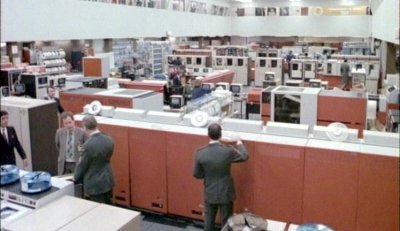 Punch cards, magnetic tape, and a bank of 20 14" five stack hard disk drives with a 4" CRT green screen monitor every crash got a polariod screenshot no way of saving it otherwise.